How to make exercise a habit | Learn to love your workout! When it comes to exercise some people are naturally self-motivated. They are the one’s who’d never skip a workout come rain or come shine. They’re the one’s who take their running shoes on holiday and actually use them. Yep, they’re NOT the one’s who come back from their vacation with a potbelly. Nope they look leaner, tan and super healthy. Exercising on holiday or at home isn’t even an inconvenience or a chore for them – they actually like it! So how do they do it? [quote_right]Everybody wants to exercise – in theory. [/quote_right]Almost everyone struggles with exercise in the beginning. You’re a beginner, your fitness levels aren’t great, and you’re not yet confident in what you’re doing. So exercising is just like everything else, you have to practice to get better. To get better you to have to do it regularly. And to do it regularly you have to make it a habit. How do you stick with it and make it happen? The secret to making exercise less of a pain and more of a joy is to make it a habit. Habits, good or bad, are established as a result of repetitive behavior. Do something enough times and it becomes a part of your daily routine. 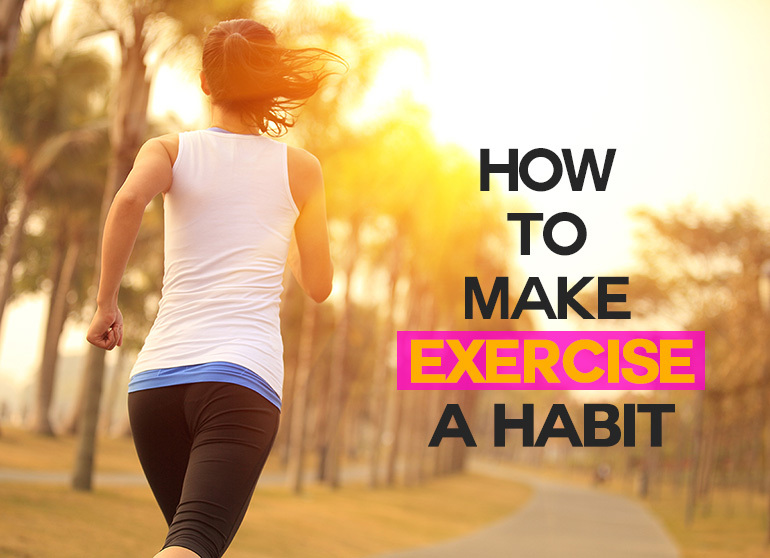 We’ll help you find some helpful and practical tips to make exercise a habit for life. Why do it? If you have a dentist appointment booked for 3pm on Wednesday, you make sure your day is organized in such a way that you are at your dentist’s office at the allotted time. Only some kind of scheduling problem or serious mishap will prevent you from going to the dentist. The same is true of most of the appointments that are part of everyday life; collecting the kids from school, dinner reservations, work meetings and movie start times. You have a specific thing to do at a specific time and so you do it. Why not treat exercise the same way? How? Two, three or four times a week, schedule your workout and then stick to that appointment like you would any other. Set a start time and a finish time and prepare for it like you would for anything else in your diary; pack your gym bag in advance, make sure you will arrive in time and try not to accidentally-on-purpose double-book yourself. No more wishy-washy pie-in-the-sky scheduling. No more just saying to yourself “I’m going to exercise more”. Make a exercise a habit by scheduling your workouts – and write it down. Why do it? “Misery loves company” or “two heads are better than one” – depending on how you look at it. Don’t exercise alone – recruiting a motivated training partner is an awesome way to make exercise more of a habit and keep you honest in your workouts. You’re unlikely to leave your training buddy hanging, which means it’s much harder to skip out on a workout. If you were going alone and decided to skip your workout, no one else would know but you. And you don’t mind. But when you know someone is counting on you to show up, you’re way more likely to make it to your exercise session. Training partners can also help distract you when you are feeling the burn, provide encouragement and correction when you need it, challenge you and push you to work harder so you get better results and keep you safe by spotting for you when you are working hard. And, of course, you’ll be doing the exact same thing for them. How? Be a little discerning when selecting a training partner. Make sure they are of a similar level of fitness, are reliable, want to exercise the same way you do, that they won’t skip workouts and that you actually enjoy their company. A good training partner can astronomically increase the odds of you making it to your workout, and massively boost your workout enjoyment and workout results. If you can’t find a suitable training partner, you can hire a personal trainer who will do all of these things and more for you and leave you free to focus on your workout. The added incentive here being that not only did stand up your personal trainer, if you’re a no-show you’re also out of pocket. Why do it? Getting fit, toning up and losing weight are all great reasons for exercising but what do these terms actually mean? If you think about it, they are pretty arbitrary expressions that don’t really mean very much. Chances are you’ll get on much better with making exercise a habit if you have specific goals in mind – a reason for working out. Once you have one or several goals, you have a focus to your workouts and a reason for hitting the gym or pounding the pavement. Choose exercise activities that will take you toward your goals and also align your diet and lifestyle to those goals. Make your goals challenging but realistic and make sure you reward yourself when you reach them. Once you have reached your goals, what do you do? Set new ones of course! You can choose loftier versions of your original goals or a whole new set of targets; it’s up to you. Why do it? Kids often refuse to do things they don’t enjoy – such as eating broccoli or tidying their rooms and grown-ups to be honest are no different! So, if you want to make exercise a habit, choose activities that you enjoy. Because even if an activity is really good for you, will develop your fitness and help you lose weight, if you don’t enjoy it, you are unlikely to stick with it. To make exercise a habit, make sure your workouts are something you look forward to and enjoy. And that when you’re done, you feel awesome. How? Try different things so you eventually hit upon the fitness activities that really turn you on. Don’t worry if this means you bounce from one activity to the next for a few months – once you hit on the right activities, you’ll soon become a fitness convert. If you find running uncomfortable, ride a bike instead. Or start with walking and slowly include short periods of slow running (follow a run/ walk plan). If lifting weights leaves you bored, try a circuit training class. If you like a bit of competition, join a sports club and play some tennis or basketball. Why do it? Like most things we do, exercise has pros and cons that should be considered. On the plus side, it can leave you feeling fit, healthy, energetic, alert, lean, strong, positive, more confident, creative, stress-free and satisfied. Basically, it’ll leave you with a pep in your step. On the down side, you need to find time to exercise, sometimes working out is uncomfortable, it may cost you money to join a gym, and you could spend the time you exercising sat on your sofa watching TV… something to balance against exercise helping you to sleep better, look better and feel better. How? Take a sheet of paper and divide it vertically in two. On one side, write all the benefits you will experience by starting and maintaining a new exercise routine. Think about not only the physical aspects but the emotional, social and even spiritual benefits of exercise too. One the other side, make a list of the negatives of exercise. These should include financial and time costs, what you may have to give up and any other negatives you can think of. On completion, you should see there are considerably more benefits than there are negatives to getting and staying fit. If you find there are more negatives than positives, maybe you need to consider a different fitness activity that tips the scales more toward the positives of exercise. Whenever you feel you are losing the battle of attrition, revisit this decision balance sheet (or even better stick it on the fridge where you can see it every day) and remind yourself of all the benefits of exercise and how much they outweigh the negatives. Everybody wants to exercise – in theory. Most people do it a few times. Very few actually do it stick with it. Putting in the extra bit of effort to make exercise a habit is truly one of the best gifts in life you can give yourself (and your family). A better quality of life, a longer life can be had through regular exercise. Like any habit, exercise can take a while to become part of your normal routine and there may well be times when you feel like throwing in the towel. Don’t worry – it’s normal. However, endeavor to stick with it and remember, in a few short months, you’ll have established a habit that will do you untold good.